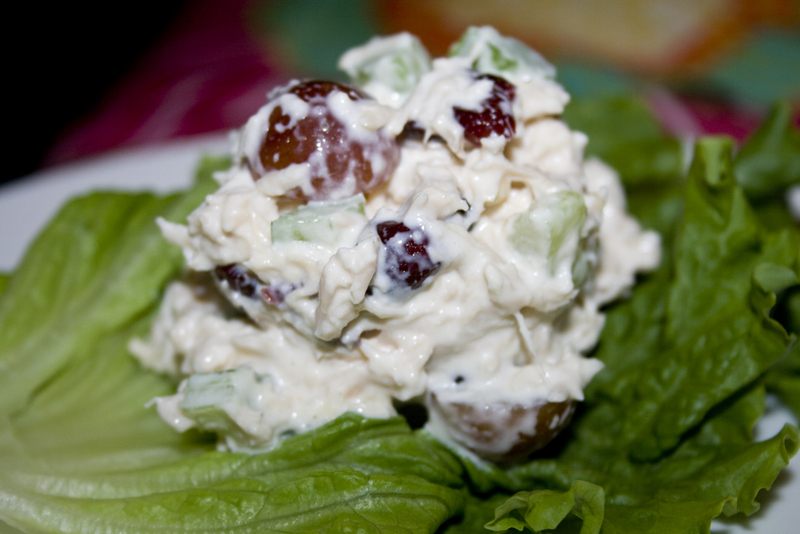 Everyone should have a favorite go-to chicken salad recipe. If you don’t, use this one. It’s the greatest in the world. I thought I’d posted this ages ago, but when my sister went looking for it there was nary a chicken salad recipe to be found. So here it is. Depending on how I’m feeling, I sometimes add a dollop of Dijon to this recipe as well. When making it for a large crowd, I do the whole thing and add the almonds last. Then I separate half of the recipe out and don’t put nuts in it. You know, to be kind to the anti-nut or allergy oppressed people. This stuff is great served on sandwiches, crackers, open-faced as a crostini or just piled on a big bed of spinach or lettuce. You can use it for appetizers at a party, a nice tea sandwich or for a light summer dinner! Enjoy! Mix together chicken, grapes, nuts, celery, cranberries, and mayo. Chill. If you cook up some chicken breasts with tarragon, they can add a nice different little flavor to the mix, too. My version is very similar, though I use walnuts instead of almonds and tend to forget about the celery. Never tried grapes, that sounds good! I’ll have to give this a whirl sometime soon. Hi there Bakerlady. I notice you haven’t posted in a while… I hope everything is ok with you and yours. Or did I miss a post about you moving your blog? If so, can you fill me in? Thank you. Love this recipe! I usually treat myself to a similar version at Wholefoods, but this is way more cost efficient. Thank you so much! You are very welcome! It is my go to recipe for tea parties, baby showers and ladies lunches! I love it! I toast the almonds and also add a chopped granny smith apple. I’ll have to try that. I love greek yogurt. Mine is similar except I use 1 tbs sugar and 3 tbs milk; beat mayo, sugar and milk together…yummmm! An addition of rice is super good. Plus, makes it go a loong way! I’ve never heard of rice in a chicken salad before. Interesting! I am glad you are back on line again. I hope you are well.